The Seac Sea-Royal HD is a two part 7mm spearfishing wetsuit made up of a hooded jacket and salopettes. 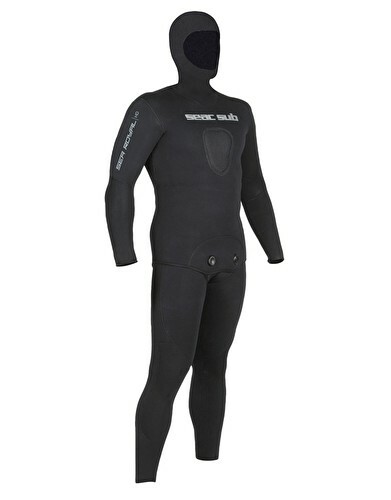 Unlike most spearfishing suits this suit has a plush lining meaning no soaping up to slide it on. The jacket has an integrated hood, a reinforced chest section and a beaver-tail fitting. There is an abrasion resistant outer material on the knees and a Melco chest protection pad for speargun loading. Single threaded outer blind stitching for high resistance. The anatomical cut has minimal stitching to improve flexibility and joints are pre-formed and pre-inclined for a natural fit. Smooth Skin and Lycra edges create an effective seal around the face, wrists and ankles and work with the plush inner lining to stop cold water flushing to keep you warmer. Available in sizes, M, L, XL, & XXL only.